The COD Digester is ideal for rapid & frequent monitoring of treatment plant efficiency and water quality. 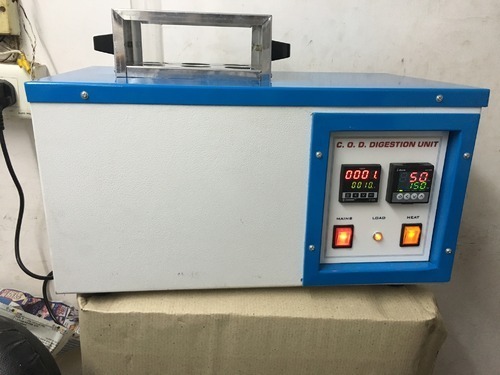 We are pleased to introduce our self as a prominent Wholesale Trader, Exporter, Distributor of Scientific Laboratory Equipment for Research & Testing Labs of Pharmaceuticals Industries, Chemical Industries, Cement Industries, Soil Industries , Paint Industries, Petroleum Industries, Cable Industries ,Textile Industries, Research Centres etc. We are in this trade since more than 30 years & all our products guaranteed for trouble free services. Our motto is to give quality products good services to all over existing & new customers. J. S. Enterprises is committed to exceeding customer expectations in all aspects of the buying process. Our sincere approach towards product innovation, client satisfaction and on-time delivery schedules has helped us to carve a special niche for ourselves in today's competitive business scenario. We want the customers' experience with us to be relaxed, convenient. We are firm believers that the customer relationships we develop should be one that lasts a lifetime.